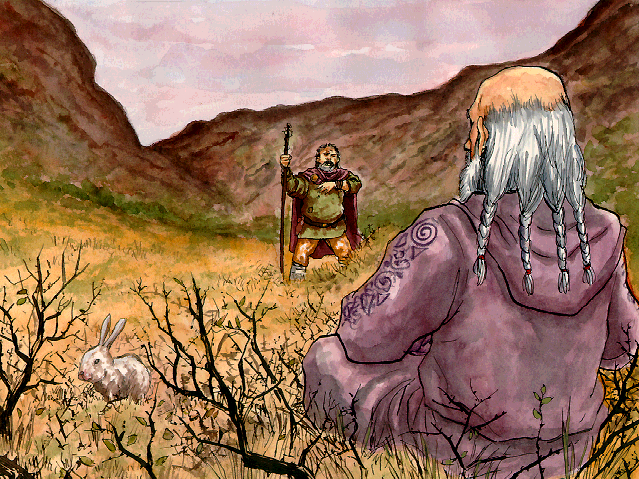 Issaries takes Brandgor to the place where the one who bought the truth lived. That god is called Grandbread. He has the truth, but it is still twisted around. Brandgor demands that he give the truth back. Grandbread refuses: "It is mine now, and you shall not have it. Knowledge is my food. As soon as I untwist the truth, I will pound it into a meal, cook it into loaves of bread, and devour it." Brandgor challenges Grandbread to a game of questions. The game of questions went on so long that Grandbread became ravenously hungry. He tried to eat the truth as it was, in its sharp and twisted form. The thorns of the distorted truth punctured his stomach, so that his torso opened up and the truth fell back out of him again. -"Why did you do that?" -"Who is the god of hunger?" -"The game of questions is over now." -"Which animals did my kinsman Issaries meet?"